Filed to: handshake.Filed to: handshake. 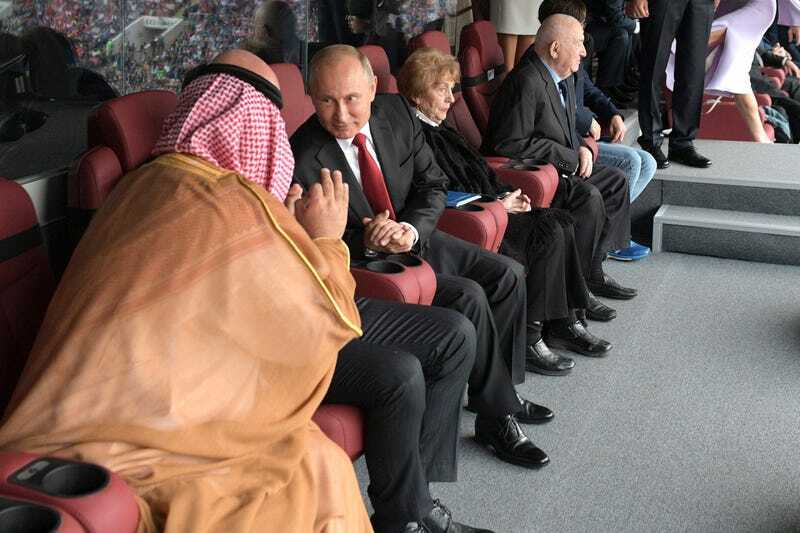 Saudi Arabia’s Crown Prince Mohammed Bin Salman Al Saud and Russia’s President Vladimir Putin during the opening ceremony prior to the 2018 FIFA World Cup Russia Group A match between Russia and Saudi Arabia at Luzhniki Stadium on June 14, 2018 in Moscow, Russia. For years, the widely copied and co-opted black handshake has been an essential part of black male life. It’s arguably the closest that black men will ever get to affection or emoting. So as such, I’m more than qualified to analyze the now-infamous handshake between Saudi Arabia’s crown prince Mohammed bin Salman and Russian President Vladimir Putin. 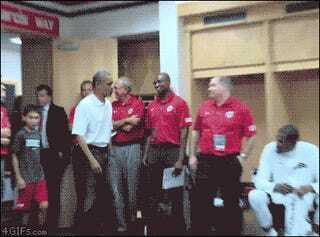 Not all handshakes are the same, former president Obama taught America this. So, when the two world leaders saw each other at the G-20 summit, they engaged in a bizarre death handshake that only two world leaders who have gone on killing with impunity can do. I’m disappointed by the Saudi Crown Prince. He’s a brown man in a durag and that dap game is weak AF. This makes me think that Mohammed bin Salman went to private school and never quite learned the intricate etiquette of a proper greeting. Salman is too apprehensive, which is understandable since white people generally have a unique feel to their skin. I don’t want to go too deep, but the textural consistency of white hands is soft and damp, like the skin of an uncooked chicken leg quarter. It can be quite jarring at first. Putin is out here doing white men all the justice. Surprisingly, Putin’s windup is nice, and he really goes for it. One thing that can break a handshake fast is non-commitment. In a millisecond, one must decide that it’s happening and then make it happen and Putin doesn’t back down. Putin’s practice at stabbing dissidents probably makes him a lot more comfortable at pre-handshake motion. It means everything you think it means. This is a celebration handshake, which is quite different than a funeral greeting. To the uninitiated, the handshakes may look the same, but to those in the know, this isn’t as much about the handshake as it is about the faces. Look at their faces, they’re celebratory. This handshake is less about the mechanics and more about the jovial nature that only killing people recklessly can bring. We might have witnessed a secret fraternity shake. We know that Putin pledged Assassin Phi Assassin in the late ‘90s but perhaps the Khashoggi killing was Salman’s probate show. WTF Is Up With That Hand Pat, Though? When I was in 7th grade I had my first real girlfriend, which meant that when the classes changed she would find me in the hallway so I could walk her to her class. One day, I walked her to her class and all her girls were standing outside talking, she asked me for a hug, which we’d never done before. I gave her a hug and I patted her back the way I used to hug my grandmother. Her friends started laughing. Later that night she told me never to pat her on the back again. The funny part is the pat on the back, much like Mohammed bin Salman, is more affectionate than not patting at all. I loved my grandmother more than anyone in the world and I thought that by patting her on the back I was conveying the same affection, also I don’t think I’d ever hugged someone in a non-grandma way by the 7th grade. Being an expert like myself doesn’t simply require the analysis of the shake, but one must be able to translate the shake. Simply put, there are only two men in that room who would have someone murdered and cut up with a bone saw. I don’t even know where one gets a bone saw. And even if I knew where to buy it, I’d be too afraid to ask the dude at Bone Saw Depot to point me in the direction of the corpse dismembering aisle. That’s why they fucks with each other.